I feel like I mention in every other blog post that T and I are on a pretty strict budget these days. Our friends are probably so tired of hearing it, too. BUT keeping our spending to a minimum is a priority in our household and will be until we get stupid student loans paid off. Although we both try to keep our spending to a minimum, T and I both really look forward to Friday lunches out. I usually reserve a little bit of money for each of us every Friday so that we can treat ourselves to whatever we're craving. I take lunches out pretty seriously. If I only get one day a week to eat something other than leftovers or a turkey sandwich, it's gotta be good. 1. 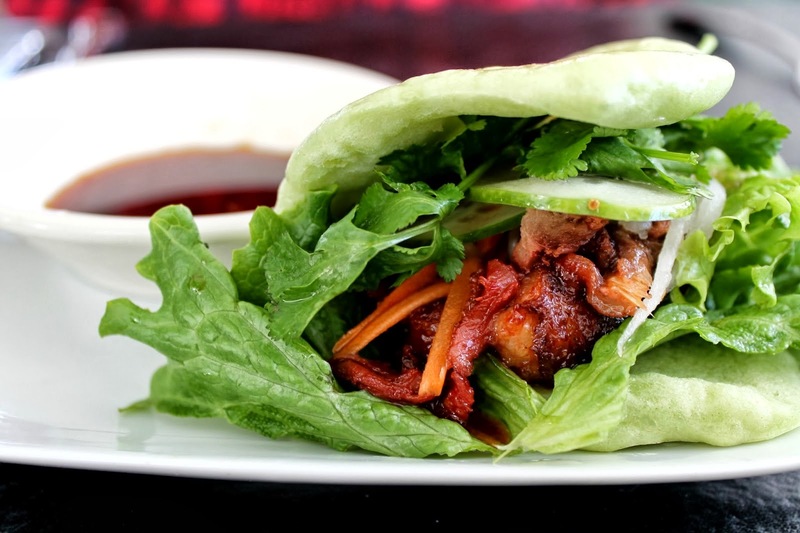 Mekong Vietnamese Restaurant- Best Banh Mi in Greenville, and their Steamed Duck Buns are out of this world. 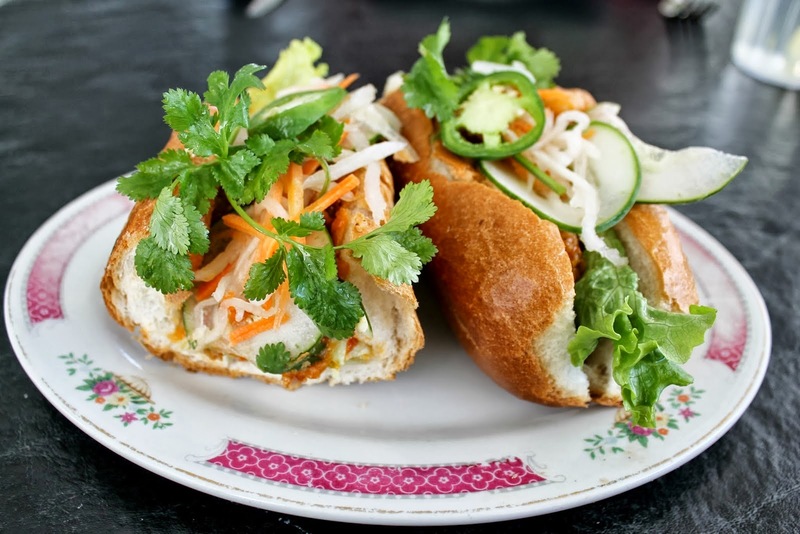 All Banh Mi sandwiches are under $4.00 and their duck bun is $2.99. Every dish is loaded with fresh vegetables and herbs, most of which are grown out back in the owner's parking lot garden. If you're needing an afternoon pick-me-up treat yourself to some Vietnamese coffee. It's decadent enough to be dessert. 2. Sacha's Cafe- Sacha's is a Colombian restaurant that has the best hot dog. 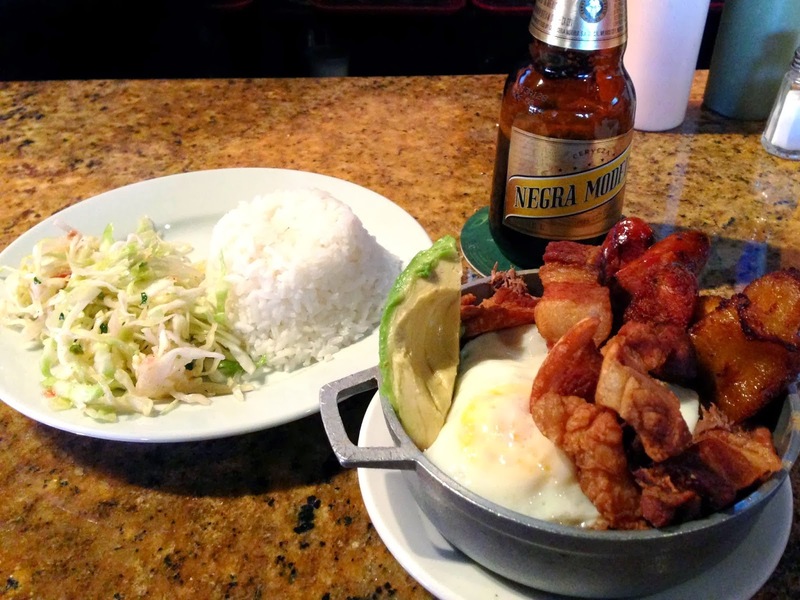 Probably not traditional Colombian fare, but it is damn good. 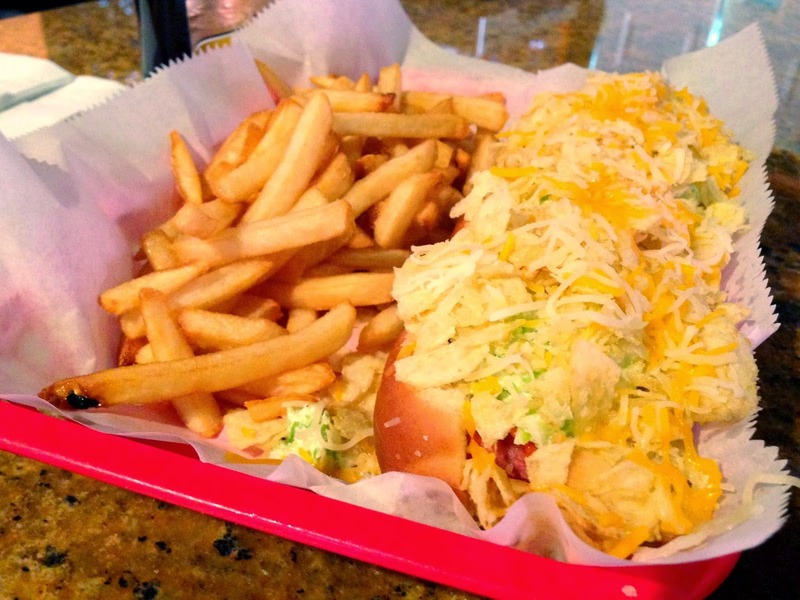 They serve a foot-long dog that's covered in bacon bits, slaw, cheese and crushed potato chips. Yes, crushed potato chips. If you'd like to go more of a traditional route, their Montanera Cazuelita is amazing. It's a crock filled with rice, pinto beans, ground beef, sausage, fresh bacon, plantains, avocado, and a fried egg. 3. Tasty Korean BBQ- I love a bento box (who doesn't) but at dinnertime they're always ridiculously priced. 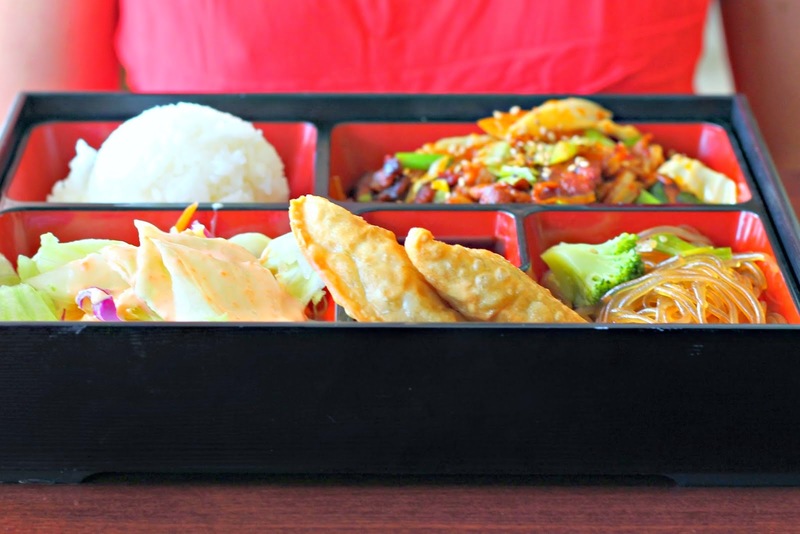 Korean BBQ offers a lunch bento box for under $10. My favorite is their grilled pork. The box also comes with rice, a salad, a noodle dish, and two fried dumplings. Wash it all down with one of their Korean beers, and you're good to go. 4. Tropical Grill- I've always ordered the same thing at this Cuban restaurant, but it's so good I have no desire to branch out. Their Classic Chop is incredible. 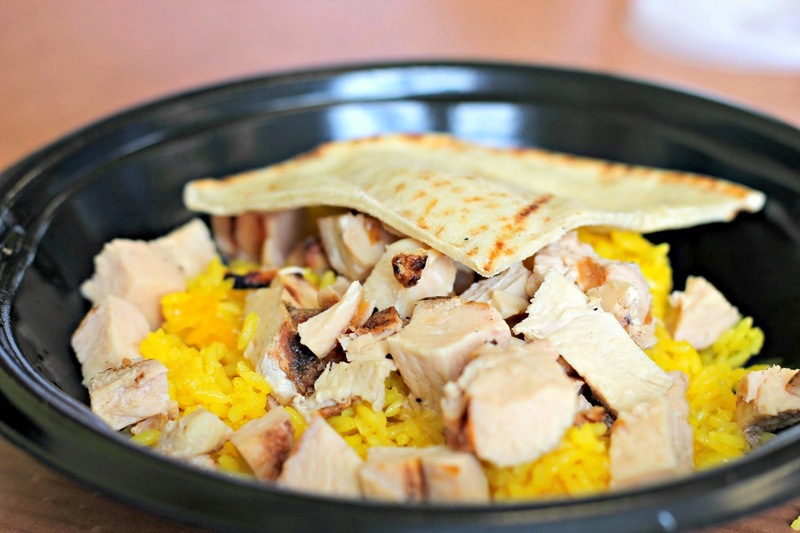 Chopped chicken and saffron rice served with three sauces that will take the dish to a whole new level. The curry sauce is my favorite. The sweet creamy curry sauce adds the most unique flavor to this dish. Bring some gum or mints with you though, your breath will be kickin' when you leave this place. Do y'all have any favorite lunch spots around town? I'd love to get some more ideas! Like you, I don't get out much for lunch, so when I do, it really is a treat! Fresh to Order has been one of my favorites lately. And, I can never turn down Midtown Deli! When my husband and I lived in Raleigh, there was a little Vietnamese place that we'd always go to, and I miss the food. I keep trying to get him to try Mekong, but he can't get past the outside of the place. I keep telling him to stop judging the book by its cover!